We’re back for another What’s-on-TV Check-In. Halloween comes tonight and the November sweeps month starts tomorrow. This should mean some quality TV on the big networks primetime shows. 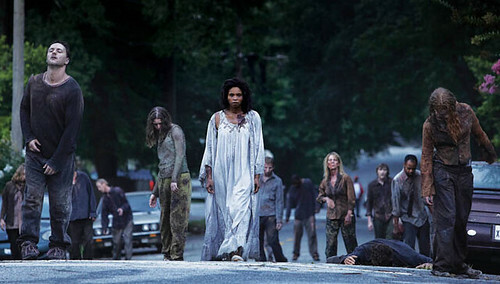 The Walking Dead premieres on AMC Halloween Night! Dead Set (7:30pm on IFC) IFC gives us the complete 4-episode horror-comedy series imported from UK. Meteorite Men (9pm on Science – HD) Season 2 premiere begins the hunt for more meteorites. Secrets of the Dead (8pm on PBS – HD) Season 10 premiere of this show that uses techniques of modern forensic science are used to investigate historical mysteries to find proof of what really happened. Circus (9pm on PBS – HD) New series on PBS that invites viewers to take a look behind the scenes, of the big top to the back lot. "Circus" tells the story of what it takes to make it as a performer in the Big Apple Circus.